12th Night Launches 2015 Carnival Season in New Orleans! 12th Night has come and gone. The 2015 Mardi Gras season has arrived. My parade, Krewe du Vieux, rolls later this month with an all new route. That’s for another entry. This entry is about the Phunny Phorty Phellows, who roll on a decorated streetcar and Krewe de Jeanne D’Arc, who rolled downtown in the French Quarter, which means they basically are a walking parade, much like my own KdV. All of Joan of Arc’s throws are handmade. That is rather extraordinary, as krewes, even walking krewes throw a lot of throws. Another interesting aspect of this krewe is their obsession with Joan of Arc. Krewe members often refer to their namesake as ‘Joan’. That is a bit weird. The Phellows are a historic group, dating back to 1878. REX formed in 1872, making PPP virtually as old. In the old days, they were a parading group. For their first parade, PPP followed REX, which they did for the next few years. They stopped parading in 1898. The modern krewe was revived in 1981 and became a streetcar riding krewe in 1982. From 1981 to 1986, PPP marched with the Contemporary Art Center’s Krewe of Clones. 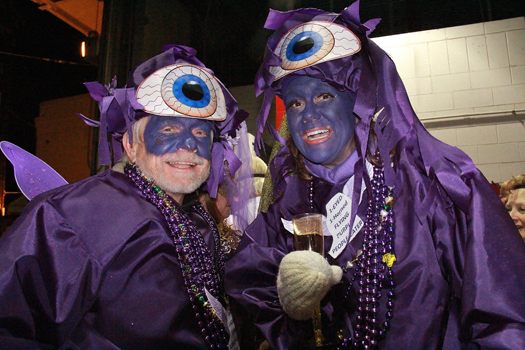 The Clones are the predecessors of Krewe du Vieux. I was in Clones and am in Krewe du Vieux, which any reader of this blog certainly knows. 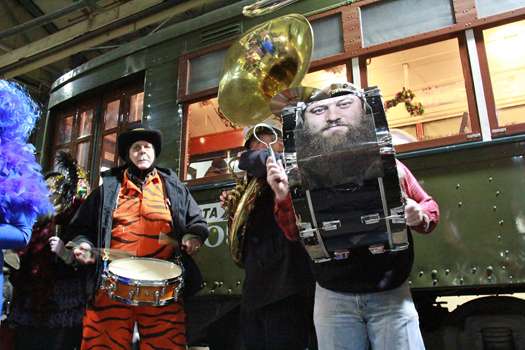 The Storyville Stompers are the official band for the Streetcar Ride and Benny Grunch and the Bunch play at the Coronation Ball. Other innovations and features: Beautiful invitations and dance cards like 1800s by a series of royal artists: Beth Kesmodel, Hal Pluche, Jeanne Woods, Arthur Nead, and Kevin Barre.